Four more years of Burning Abyss. (1) When your opponent activates a card or effect that would destroy a card(s) on the field: negate that effect, then send 1 Level 3 or lower DARK monster from your Deck to the GY. I am genuinely surprised we got this card. Honestly, it is very generic. 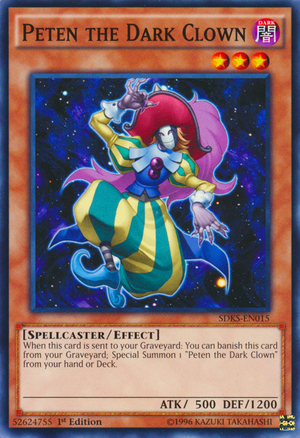 It's not hard to splash some Level 3 or lower DARK Monsters in your Deck, and it's more versatile than Starlight Road. For a more serious answer, splash in Necro Gardna. Upgrade to Peten. Get a free summon. But what is that thing? It can't be from a movie pack; this set has cards from both movies. Archfiend Heiress, Shaddoll Hedgehog/Falco, Phantom Knights, D/D/Ds, Djinns, Doppelwarrior, etc. Last edited by Archsorcerer; 3rd February 2019 at 10:56 PM. They revealed this next to Catoblepas. What are the chances Konami makes a level 3 or lower mini DM or DMG that works with the spells and traps? Kinda like a Neos Alius. Guessing Ankuriboh will be the last of the batch.